Arnie's March provides an opportunity to recognize and honor our cancer fighters, their families, hospital staff, and supporters. All our participants enjoy a fun event as well as opportunities to win prizes for fundraising, completing activities, inviting others, and spreading the word on social media. It's only $25 for an adult to register to attend the march. Join Akron Children's Hospital and University Hospitals Rainbow Babies & Children’s Hospital by creating or joining a fundraising team, making a donation and registering to march. Funds raised stay local to support pediatric cancer care at our two partner hospitals. Your tickets will be available at will call. Funds raised through Arnie’s March directly benefit care for the children and families in Northeast Ohio battling childhood cancer. Arnie's March supports pediatric cancer programs and funds crucial research efforts to fight childhood cancer. Our local hospitals are actively working to develop more effective treatment methods to fight childhood cancer. The funds raised by Arnie's March support the efforts of our area oncology programs at Akron Children's Hospital and University Hospitals Rainbow Babies & Children's Hospital. Because the children treated at Akron Children's Hospital and University Hospitals Rainbow Babies & Children's Hospital deserve the best care close to home. Through Arnie's March, you can help support the pediatric clinical trial programs to fund crucial research efforts to fight childhood cancer. Akron Children’s Hospital is ranked among the best pediatric hospitals by U.S. News & World Report, but it’s our compassionate approach to treatment that makes us truly exceptional. To ensure families have convenient access to care, we have two hospital campuses in northeast Ohio and 60+ primary, specialty and urgent care locations. We collaborate with many community partners to bring our neonatal and pediatric expertise to patients in their healthcare facilities, and our home care and school health nurses treat kids in their homes and schools. With more than 1 million patient visits in 2016, we’ve been leading the way to healthier futures for children through quality patient care, education, advocacy, community service and medical discovery since 1890. 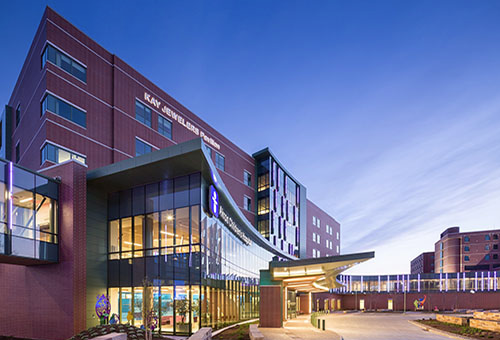 Learn More About Akron Children's Hospital. UH Rainbow Babies & Children’s Hospital is a 244-bed, full-service children’s hospital and academic medical center. A trusted leader in pediatric health care for more than 125 years, UH Rainbow Babies & Children’s Hospital consistently ranks among the top children’s hospitals in the nation. UH Rainbow Babies & Children’s Hospital’s dedicated team of more than 1,300 pediatric specialists uses the most advanced treatments and latest innovations to deliver the complete range of pediatric specialty services for 700,000 patient encounters, annually. Interested in becoming a sponsor? Learn more or contact Bobby at bmccaffrey@arniesarmy.org.